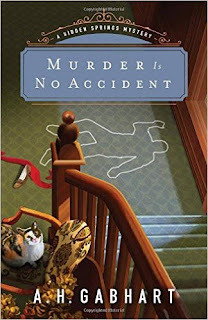 Murder is No Accident is the third installment from Ann Gabhart's series, Hidden Springs Mystery. Maggie finds herself in quite a situation when she sneaks into an old Victorian mansion. Two people are murdered in the house and her life is, also, threatened. Sheriff Michael Keane must catch the killer before another life is shortened. I enjoyed this cozy little mystery of who done it. I was surprised to find out how the mystery was solved. I liked Maggie from the beginning and felt so bad for her for what she went through in the story. I, also, enjoyed Sheriff Michael and his developing romance with Alex. I am hoping there is another upcoming release in the future from the series, so I can read more about these two. I found this book to be a great read and hope to read more of the series in the future, as I have enjoyed the whole series so far.